Knowledge Management Online KM Open Source Version 1 has been freely donated by Knowledge Associates International Ltd as a foundation for the members to collectively develop and improve Version 2, scheduled for release in January 2011. This section contains details of an online open source 'Directory of Knowledge Management Processes, Methods, Tools and Techniques' to be considered for selection within a Knowledge Management Implementation initiative. Firstly, the Directory contains a categorised list, followed by a ‘Big Picture’ which illustrates and suggests how these principles, processes, methods and tools map on to, and support, the overall process of better Knowledge Management. There then follows, for each item, a brief description and where possible, further references and, where appropriate, some templates, instructions and measurement criteria for evaluation and implementation. As new Knowledge Management processes, methods, tools and techniques are emerging rapidly, this open source Directory is considered to be the first of several regular releases. The aim is to provide the KM consultant, KM Practitioner and Organisation who are about to embark on a KM initiative with a framework and practical tools to assist with a successful implementation. 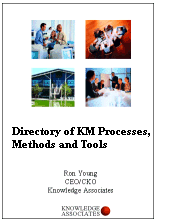 The KM Consulting Methodology consists of 3 Parts, each comprising of a series of modules.